An uninsured drink-driver who killed three passengers when he crashed is facing release after serving three years of a nine-year sentence. Jamie Riddick was almost double the legal alcohol limit and driving a car with no MoT and defective brakes. Nathan Rhodes, 23, Ryan Case, 25, and Emily Jennings, 27, died almost instantly in Leamington Spa in 2015. Their mothers say they are devastated after learning of his planned release on temporary licence. They were told of the news during a phone call from the Probation Service. Gillian Jennings, mother of Emily, told the BBC: "Quite honestly, the law is a farce. he may as well have just taken a knife out and stabbed our children to death because to me, he's murdered them." Riddick, 21, admitted three counts of causing death by dangerous driving at Coventry Crown Court in 2016. He had offered to give the three friends and another man a lift outside a nightclub in the early hours. But his Citroen Saxo - an insurance write-off bought for just £375 - careered off Radford Road when he cut a corner and hit a tree. Image caption Emily's mother Gillian Jennings said the law was "a farce"
Riddick, who was saved by an airbag, initially lied to police, telling them he hadn't been behind the wheel. 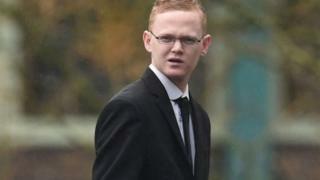 Mr Rhodes' mother, Barbara Hatcher, said: "It had no brakes, it had no insurance, no tax, he only had a provisional driving licence. "As far as I'm concerned he was driving a lethal weapon." Hazel Case, Ryan's mother, said his death had been of a "huge cost" to the family. "He had two little girls that were three and four at the time so it's affected a lot of people," she said. A Prison Service spokesperson said it was introducing life sentences "for those who cause death by dangerous driving to reflect the impact it has for victims and their loved ones". "Anyone released on temporary licence must meet strict criteria and pass a full-risk assessment before being considered for release." A spokeswoman from road safety charity Brake said grieving relatives "are left to feel grossly let down by our legal system which lets serious offenders get away with pitiful penalties". "Mr Riddick's illegal and dangerous actions led to the needless loss of these three young lives and he should have to face the consequences of his actions," she added. "The government must implement the tougher sentences for drivers who kill it promised almost 18 months ago and commence a broader review of road traffic offences as a priority."